This past weekend Mark Beeson of Granger Community Church had an illustration in his message using a flannel graph. I know I am showing my age and also my church background because many people will not even know what a flannel graph was. Well for the uninitiated a flannel graph was the cutting edge of children's ministry 40 years ago. Sunday School teachers used little felt figures on a board to tell a bible story in a visual way. A poor mans animation. The reason I say this is that it sent my mind back to my mum. My mum died eight years ago this past week. For most of her life she taught in our church Sunday school. Because of illness she eventually had to give up teaching. I can remember her telling me that she was disappointed that she had not quite completed 40 years as a teacher. She had a passion for teaching children that kept her involved in it for the long haul. What I do remember was all the flannel graph stories. I did not only get them at Sunday School but I got to see them at home when she was practicing for her "preach". The flannel graph and my mum introduced me to all the wonderful stories of the Bible and I will be ever grateful to both of them. 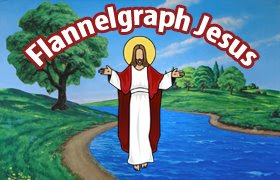 I too remember flannel graph and am in the process of trying to get one for our sunday school as I feel it is a great way to tell a story. Aren'e we fortunate to have had good parents! I too have used flannel for Sunday school. my own cut outs onto the flannel. WHat can I put on the back of them? Can you write me. Thank you.